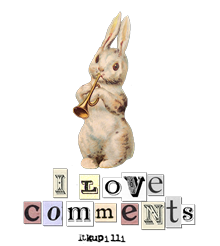 An intermediate ’emergency’ post this week, bringing my total to three by the time my scheduled post is published tomorrow and it will only be Tuesday. Tialys overload! Sorry about that but it probably won’t ever happen again. I wanted your valued opinions on a baby quilt I’m making. The recipient will be my (other) niece who is due to have a girl baby in June. I had some entirely different fabric in mind when I went to root through my stash but then I came across this little lot. I like the pale green and I thought the orange foxes and small black details would give it a lovely, modern feel. I chose this pattern from Craft Buds which uses HSTs (half square triangles) and also has a modern look to it so I thought it would be a perfect marriage of pattern and fabrics. Click on photo to go to Craft Buds free pattern. 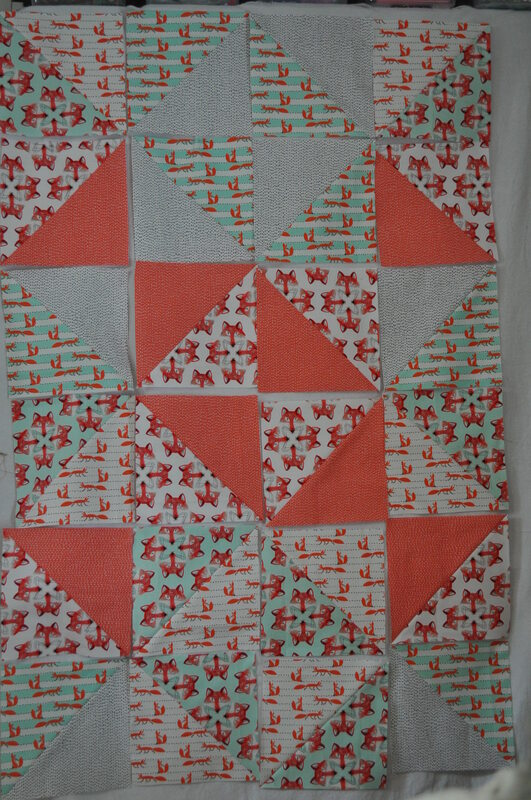 The triangles are made using a method which gives you four HSTs at once. You separate your fat quarters into three pairs, then place two 18inch squares of one pair right sides together and draw a diagonal line from corner to corner. Marking a quarter of an inch from each centre diagonal, you then sew down those four lines. Cut through the centre both horizontally and vertically and then cut each resulting square on the original diagonal mark. Confused? Just click on the above photo to see a much more comprehensive explanation. This is what my fabrics looked like laid out flat. I expect, unlike me at that stage, you can already see my problem. Those smaller foxes are directional and, because of the cutting method used by this pattern they were all over the place which, because the blocks are large at 8 inches square and the design of the quilt is geometric, just didn’t really look right. Craft Buds had the same ‘problem’ – see her layout below – but her fabrics don’t have any ‘characters’ on them and it really doesn’t matter which way up a pair of scissors goes does it? 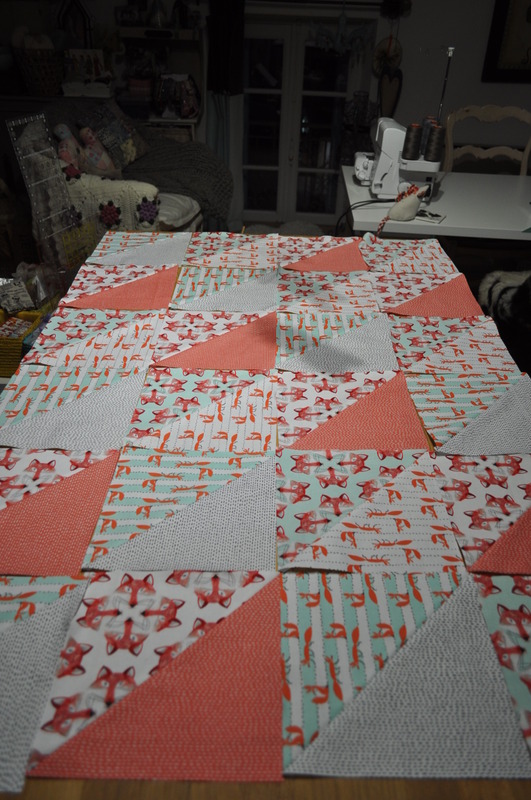 So, despite what I said to Cathy on her blog the other day about direction not really mattering as a quilt is viewed from all angles, in this case, I don’t think I’d be happy with the layout as originally planned. See what I mean? Click on the photo for a closer look. So, I then had to play with all the blocks to see if I could make a half decent design whilst getting all the small foxes to stand on their feet. Here they are, precariously clinging to a flannelette sheet on my makeshift design wall……. ……… and a distance shot so you can see the overall effect. It will have a border around it – probably some tiny black flowers on a white background I have – but this is it at the moment. HELP!! What do you think? 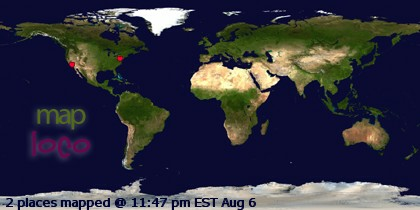 Can you see any glaring anomalies in the new layout? Can you think of any other way I could do it? Or do you think I should stick with the topsy turvy foxes? Also, what do you think of the colour scheme? Do you think it is ‘girly’ enough? I do have some soft, pastelly, birds, rabbits and flowers fat quarters which I’ve long had in mind for the next baby in the family but, if I used this pattern, I would have had the same problem with direction – although the prints in that range are much smaller so I could probably get away with it. All opinions, advice and admonishments happily received. p.s. Another title I possibly have to apologise for but I just can’t help myself.